Each year we pick up a few bags of apple drops at aunt Marian’s house to help her keep her yard clean. Apparently we have just taken a small portion of the available apples. This year we filled a full pickup truck from one tree. And that was just the start of the drop. 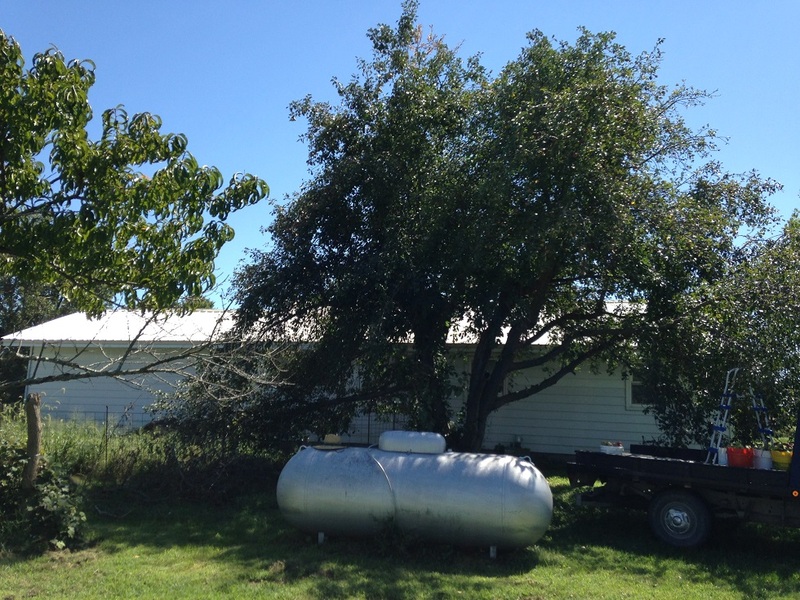 So when you wonder to yourself, “How many apple trees do I need?” remember she has three mature apple trees in her yard and it makes this point well: You don’t need a big orchard. Her Mutsu tree is her prized possession. This is the tree I prune when she isn’t looking. I can usually prune about a quarter of the tree before she gets her slippers on and tells me I have cut too much wood off of the tree. Mainly I try to keep the chimney empty, remove lower and crossing branches and cut out anything dead. The tree is also reaching over to her grape vines so I have been working to shorten its reach over time. She just wants me to remove anything that is touching. So I play this little game. I express my love by pruning her trees. She expresses her love by not staying angry with me. The Mutsu ripens later in the season. This summer has been cool and the apples are already sweet if you can stumble through the drops to pick one from the tree. The tree by the house is an unknown. She ordered a number of trees through the mail some decades ago and didn’t get what she ordered. I think this is one of the wrong trees but it makes a HUGE quantity of sweet red apples every year and seems to be resistant to fire blight. When she had her roof replaced the roofers took certain liberties with the limbs overhanging the roof. Since I always start with the Mutsu tree, aunt Marian was out there with me and prevented me from doing anything other than cutting out a specific broken limb. The long limb on the left offers additional shade in her dog pen. You should see all the apples in there! Since the limb points down it focuses on apple production. Go read up on training vs. pruning trees. Finally there is a Johnny Appleseed tree in the corner of her yard. This tree grew out of a compost pile. It makes a mild transparent-type apple but she rarely uses the apples. It has never been pruned short of when she asked me to cut out dead wood last winter. She was surprised and disappointed how much dead wood was in the tree. I think the tree is just about finished. I may gather a cutting or two. Most of the drops from this tree feed the wildlife that venture into the corner of the yard far away from the dog. 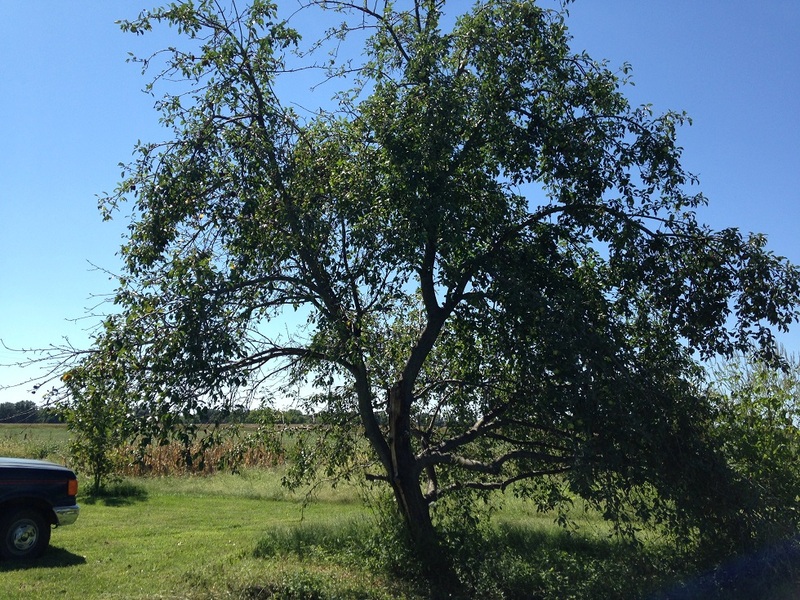 I don’t think I’m exaggerating to suggest that I could fill five or six pickup trucks with this year’s apple crop from these three trees…even just the drops. The four pigs and layer flock, it turns out, are only so interested in eating apples. They can have enough. I don’t know what aunt Marian did with them all. We have considered unloading them in rows in the pasture allowing trees to sprout where we think we would like to have them…but who knows. It is important to pick up the drops to keep the apple pest populations lower. We just haven’t really solved the problem yet. 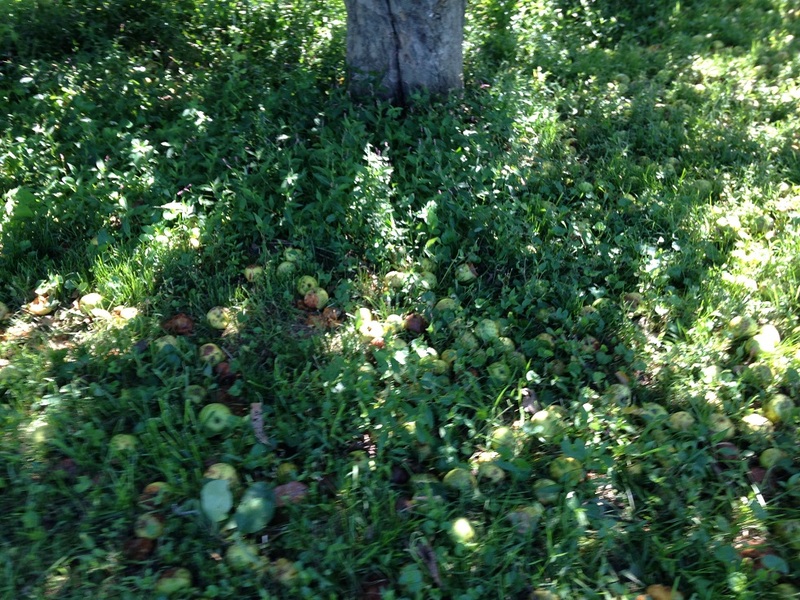 And there are more apples rotting on the ground as I type. Ugh. And buckets of apples in my kitchen waiting to become applesauce. This entry was posted in Forestry, Gardening and tagged Apple Drops, How Many Apple Trees do I Need. Bookmark the permalink. That’s a lot of apples! Only dreams of that many apples over here…. but I imagine we’d try to sell some if we had extra. Based on the little research I have done, apples are only slightly more valuable than grass. If you can do something to add value to them you’re better off. 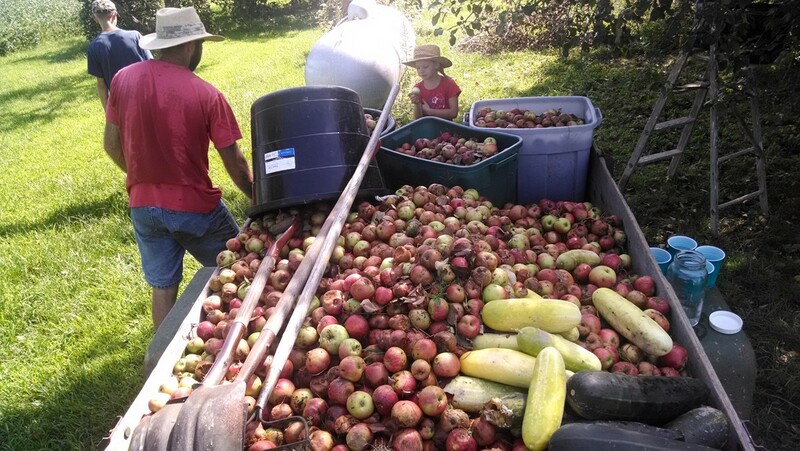 Juice, seedlings, hard cider, apple butter, bacon…all easier to market than apples. Store better too. yep. our plan is to ‘do all of the above’… but first we have to create the ‘problem’ of over abundance which requires waiting 4 years? That’s a whole lot of apples. I think I am the Aunt Marian of my tree service guys’ existence. They keep smiling and do whatever they think best…they also seem to try and come when I’m not here…go figure. We get a lot of drops, but not as many as you. I try to keep on top of it from the beginning of the season, so a bucket at a time goes to the chickens, about a half bucket to the pigs (there are only 2) daily, but it’s true, the chickens in particular seem to reach capacity on apples after a while. I sauce a whole bunch, make pies and crisps to freeze from a few, and we juice the rest through a local guy. Selling them won’t happen as there’s plenty of codling moth. We usually can up a bunch of apple pie in a jar but the apple maggot damage is too great. We just cut the best out of an apple and make sauce this year. Pickup truck loads of organically grown apples… It’s my understanding that warm, skillet baked apple pie with homemade whip cream is a life changing experience. 🙂 My encounters are seriously lacking due to the price tag of organics. If you sense a lack of empathy for your plight, you would be correct. Jealousy will do that. However, it will all soon come back to haunt me when our Satsuma trees are ready for harvesting. Trade ya!! You spoke about growing apple trees from seed. Could you elaborate? I have two small trees growing whose seeds were already starting to root inside a Gala apple. It’s my understanding they won’t grow true, but I took pity on the cute little fellas. Do you use the cuttings you take for grafting or or do something else with them? How do you view the world? Do you live in a world of abundance or a world of scarcity? Are you walking in blessing or are you a victim? Let’s embrace the opportunity in those seedlings! You are not wasting your time. You are growing trees! There is a chance those apple trees could grow to produce an apple like the world has never seen…but probably somewhat similar to Gala. Maybe something that would be commercially viable. Absolutely let them grow. Plant a few hundred more while you are at it. What’s the worst that could happen? You’ll end up with a strong root system you can graft onto. 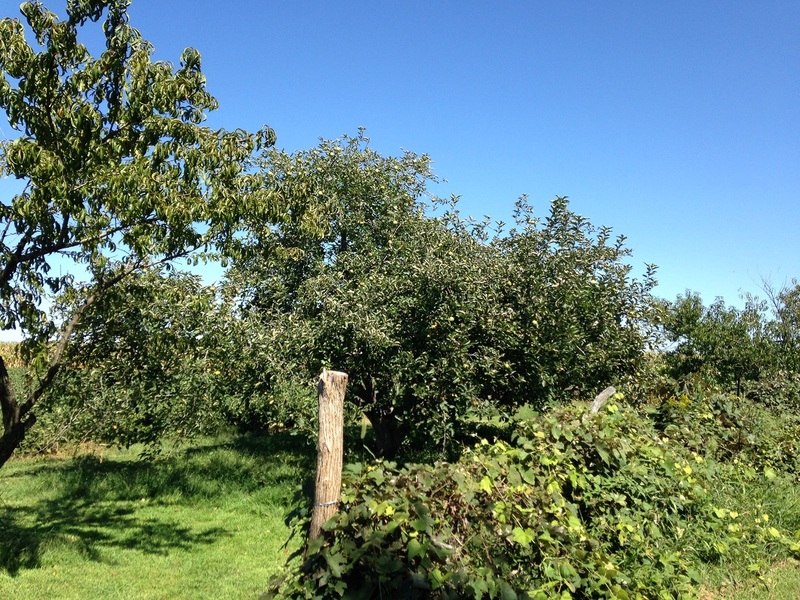 Check out The Permaculture Orchard video. It’s totally worth your time if you are interested in this topic. Stephen was recently interviewed on The Survival Podcast for another option. Heck, Mark Shepard was recently interviewed there too. Both have quite a bit to say in favor of seedling apple trees. Seedling hugging… I can definitely do that. I’ll be sure to check out the video. Thank you sir. You and yours take care.